I’m thrilled that Spain has won their first World Cup and was joyful like many others yesterday after that last minute goal. Over the weekend, I also had a lovely wine from Spain which is this week’s pick as Wine of the Week: Esencia from Castillo de Monjardín. 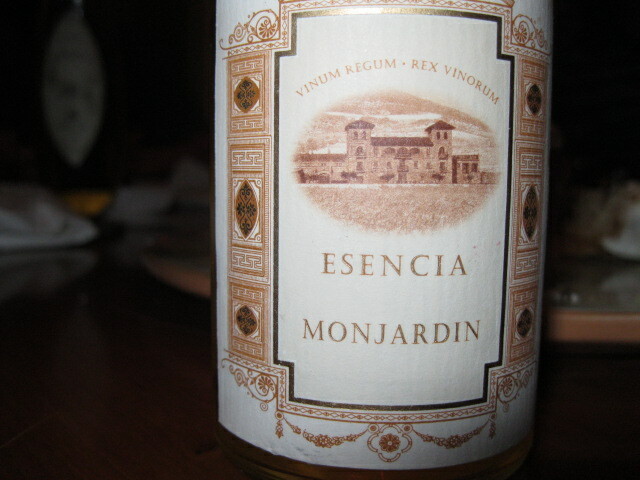 Castillo de Monjardin was founded in the 1980s by Victor Del Villar and his wife Sonia Olano. The Monjardin Castle was a was considered strategic in the 8th and 10th centuries when the Moors fought with the Kings of Navarra for control. Danica, my friend and fellow wine and WSET colleague made a fantastic meal for a group of friends and shared this wonderful bottle. de Monjardín, located at 580 meters above sea level. Botrytis Cinerea has effected this grape giving it a lovely honeyed, apricot flavor. I’m a huge dessert wine fan and had never had this one. It was quite sweet but paired well with cupcakes and would have gone well with cheeses too. The Kingdom of Navarra calls itself the land of diversity and i have infact had a variety of wines from that area, all very different. I’ve had roses from Garnacha, dry reds from international varieties and sweet wines from Moscatel but never a wine like this one. I was also told at the wine shop on Sunday of a traditional after dinner drink called Pacharan made with sloe berries that hails from the region. Navarra was an independant Kingdom from the 11th to the 15th centuries. It was the beginning of the St. James’ Way or the Cammina de Santiago, the famous pilgrimage from the Pyrenees to Santiago de Compostela where St. James is buried. 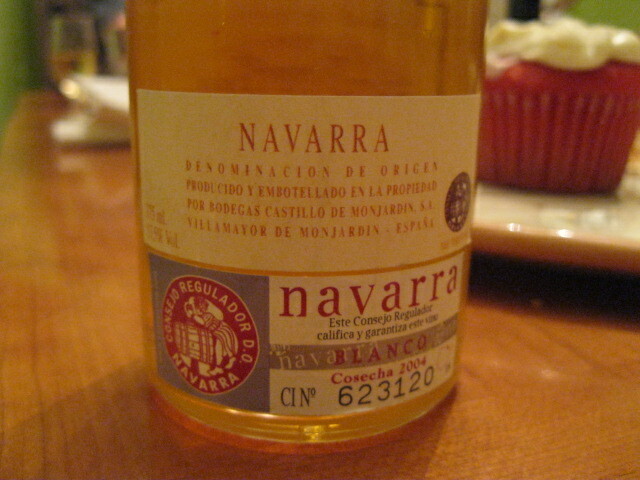 Navarra was among the first Denomination Origen (DO) regions in Spain, given the appellation in 1933 and is divided into five subzones. The Romans brought the vine to Navarra and the monasteries along the Cammino de Santiago helped to spread the vine around Spain. The region is 60 miles long with varied temperatures along the way, rainy in the North and dry in the Middle while the South is semi desert. The area is protected by the Pyrenees and the fertile Ebro river. In addition to a variety of different microclimates, Navarra also has an abundance of soil types. I can’t wait to visit and hopefully one day will walk the Cammino de Santiago, it’s always been on my bucket list.